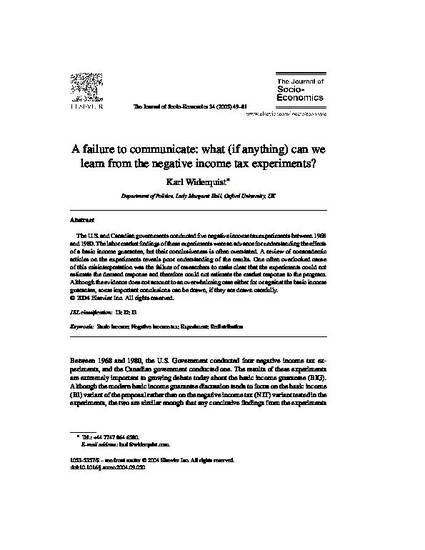 A Failure to Communicate: What (If Anything) Can we Learn from the Negative Income Tax Experiments? The U.S. and Canadian governments conducted five negative income tax experiments between 1968 and 1980. The labor market findings of these experiments were an advance for understanding the effects of a basic income guarantee, but their conclusiveness is often overstated. A review of nonacademic articles on the experiments reveals poor understanding of the results. One often overlooked cause of this misinterpretation was the failure of researchers to make clear that the experiments could not estimate the demand response and therefore could not estimate the market response to the program. Although the evidence does not amount to an overwhelming case either for or against the basic income guarantee, some important conclusions can be drawn, if they are drawn carefully.